What is the cheapest destination for a white Christmas, starting from Sydney? Japan is about 10 hours from Sydney, with direct flights to Tokyo. While snow is rare in Tokyo itself, there is tons of the white stuff anywhere in the Japan Alps (eg. Nagano), on the Japan Sea coast (eg. Kanazawa) and up in Hokkaido, where ski haven Niseko has become a virtual Aussie enclave. Japan is obviously not Christian, but Christmas is celebrated as a consumer holiday along the lines of Valentine's Day, with plenty of Christmas displays in shopping malls, Colonel Sanders decked out as Santa at KFC, etc. Korea is only a smidgen further away, with direct Sydney-Seoul flights also lasting around 10 hours. Snow in Seoul is more likely than in Tokyo, albeit far from guaranteed, and there's lots of it in the mountains, eg. 2018 Winter Olympics host Pyeongchang. What's more, a solid 30% of Korea is Christian and Christmas Day is a public holiday. Direct flights to both hover around A$1000 return, with cheaper options to both available if you're willing to route through a third country and/or use LCCs. Jetstar offers one-hop flights to Japan via Melbourne, Cairns and the Gold Coast, while Air Asia flies to various destinations in both Japan and Korea via Kuala Lumpur. Low-cost airline Jetstar offers inexpensive flights from Australia to Japan, which certainly ticks all your boxes. A northern city such as Sapporo normally has snow around Christmas and will have many Christmas-related festivities and decorations. There are also some Christian churches, if you are so inclined. Citizens of Australia and New Zealand can enter Japan visa-free for 90 days. 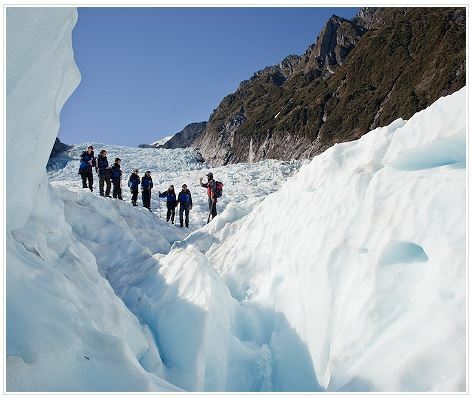 The Fox glacier is a year round ice spectacular and one of the must do when visiting the South Island of New Zealand. Snow falls at the very top of the glacier all year round, which feeds the river of ice we know as the glacier. So even in summer you are able to experience this frozen beauty. Matrix ITA shows flights to Dunedin (return 10 days later) in December (2017) from A$626 at the moment. While the sun shines on beaches in the north, it’s snow time down south. At the moment (early January 2017) there is snow in New Zealand. There happens also to be quite a lot of snow in UK just at present but here the odds round Christmas are a lot less than 90% and an air ticket likely around twice A$626. Not the answer you're looking for? Browse other questions tagged budget destinations winter sydney snow or ask your own question.